This is something new I saw on Pinterest in the last few weeks and I must say, I have never seen this before so I decided to write about that. I believe that there is at least someone who has been living under a rock like I was. I don’t really know how did I manage not to see that, but I’m happy I finally did. So, let’s talk about that. Taking all this into consideration, I just have to say that they look pretty cool. They are hidden, they look classy and they take no extra space on your table. This is why I love them. I still didn’t get one for myself since I don’t have a spare drawer just now, but I do plan to get it in the future to see how will it work for me. I like my acrylic makeup organizer since I travel a lot and I like to keep with me at all times. Also, it’s clear and I can see what I have and what I don’t have and put my makeup on accordingly. While I see why this is a great way to store and use your makeup I don’t really see myself using it much in the future. But are all different from each other and you may like it more than I do. 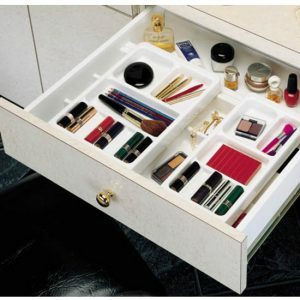 If you like everything to have its place, you don’t have lots of makeup, this could actually be quite a solution for you, but if you don’t like that, then a standard makeup organizer will have to do. Where should you keep your makeup organizer? Hello there! My name is Barbara and I love makeup. I made this simple website to guide you trough buying a perfect makeup organizer that will fit your needs. I will be writing cool new tips often on this website so make sure to check the blog section.